tomentosa occurs in soils rich in organic matter, areas of primary forests, salt marshes and banks of watercourses; whereas, U.
Pharmacological studies conducted with extracts from U.
Alkaloids are the most important group of secondary metabolites reported in the species U.
tomentosa is more commercialized and; therefore, has a higher value in the market than U. However, development of this subject for the species U. Se evaluo la respuesta de la regeneracion natural de la U. Se evaluo como afectan estas condiciones de cobertura y luz a la regeneracion de U.
Para evaluar la influencia del factor ambiental luz o iluminacion, sobre la regeneracion natural de U.
Para medir el diametro promedio de cada uno de los individuos de la regeneracion natural de U. 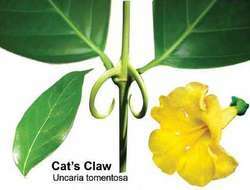 These results indicate that while both species of cat's claw provide effective antioxidant and anti-inflammatory activities, U. However, there is a lack of scientific data comparing the efficacy of the species U. In this study, suppression of TNF[alpha] formation was observed in both forms of cat's claw at low concentrations, although U.